The W-plot is a model of story structure widely discussed and used by novelists and screenwriters. There are several different versions and, to be honest, I'm not sure which one came first. Mary Carroll Moore, author of a dozen novels as well as the writing guide, Your Book Starts Here, made a video about this plot model which is available on Youtube. This makes her version one of the most accessible, so for that reason, I will use it as a basis for comparison with Dramatica. 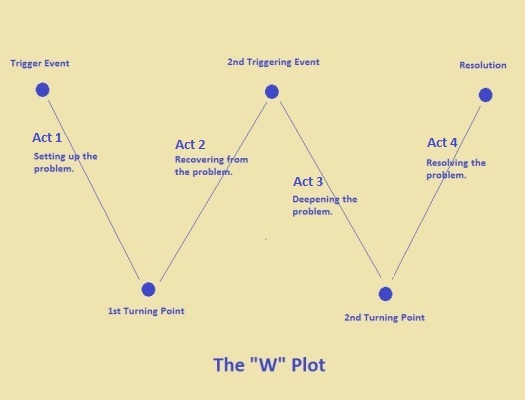 As you can see, the W-plot is anchored by five turning points, which make up the points of the “W.” A series of events connects each turning point to the next in sequence, and each series represents a different phase in dealing with the story problem. I should point out that, for some reason, writers tend to fall into two groups: those who feel most comfortable with 3-act structures, and those who feel most comfortable with 4-acts. As someone who falls into the latter category, I think our fixation on 3-act structures stems from an over-reliance on Aristotle, who first said that every story has a beginning, a middle, and an end. While this is certainly true, writers often struggle with the problem that the middle (Act 2 in a 3-act structure) is the longest part of the story, and also harder to define. For this reason, the fact that it makes more sense to describe the middle as two separate acts escapes Aristotle and most people ever since (until Dramatica). At any rate, in her video, Moore describes the W-plot as a model of a 3-Act structure. I've added vertical lines for the act breaks to the drawing above, in accordance with her description. Incidentally, I have noticed that most models of story structure that are based on 3-acts include a turning point in the middle of Act 2. The W-plot is just one obvious example. On the one hand, this should come as no surprise, since all these models are just different ways to describe the same universal story structure. However, it's one reason 4-act models make more sense to me. The first and most obvious point of similarity between the W-Plot and Dramatica is the turning points, which are identical to what Dramatica calls the “drivers.” These are the events that drive or cause the rest of the events in an act to occur. The important point here is that the driver or turning point begins an act by pushing the story in a new direction which then has to be explored in the sequence of events that follows. In addition, the drivers of a story will either all be actions or all decisions. Moore recommends choosing these five turning points or driver events as a first step in solidifying your plot, and I can't argue with that. Okay, so far Dramatica and the W-plot are in agreement, with Dramatica being perhaps a little more precise. Now let's look at what happens between the turning points, which make up the bulk of each act. The reason the Signposts are stacked on top of each other on the table rather than arranged in the order they would appear in the story is that the order of Signposts can vary with each story. For instance, some stories begin with an event that introduces the main character and his/her nature. Others begin with the first time the main character sees the impact character and becomes aware of his/her different approach. A romance might start with an event that sets up the initial relationship between the two romantic leads. And some stories begin with an event from the overall plot. 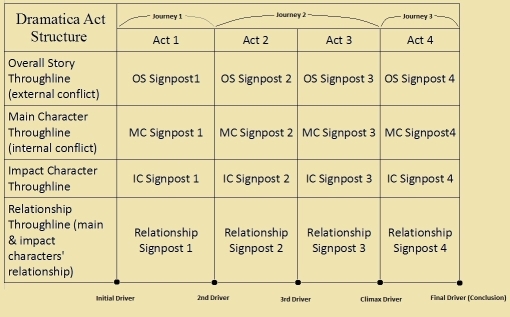 The general rule, however, is that all the Signpost 1's must be explored before you move on to Act 2. All the Signpost 2's must be explored before you move on to Act 3, etc. This rule, plus the drivers, are what create the feeling of act breaks. Because of the need to weave back and forth between the four throughlines, the Dramatica model can appear a little more complex. However, the advantage is that it is more complete. So far as I know, it is the only story model that includes the Impact and Relationship arcs as separate throughlines. Often when people try to describe a plot as a single sequences of events, they simply describe the overall throughline (since that is often the most obvious). However, sometimes signposts from the other throughlines are so glaring that they cannot be ignored, so the theorist or writer will insert them as additional or minor turning points in the structure. Moore does this when she suggests there is often an additional epiphany or crisis towards the end of the last sequence (her Act 3, my Act 4). I suspect she is referring to the fourth signpost in the main character's throughline, or one of the other throughlines (she does say it depends on the genre). Neither approach is right or wrong if it makes sense to you on an emotional level. Incidentally, feel free to watch Moore's video on the W-plot. If you are new to the idea of story structure, it is a good introduction.